Suited to a wide range of work and domestic environments, this Magic Foam Eraser for Scuffs and Marks works hard to remove tough stains. Suitable for effectively eliminating scuffs, crayon, grime and limescale, the sizeable eraser need only be combined with water to activate it's powerful cleaning properties. A great option for cleaning everything from taps, tiles, baths and sinks through to stainless steel, shoes and even floors or walls, this durable cleaning tool also works hard to remove burnt on stains found in cooking utensils. 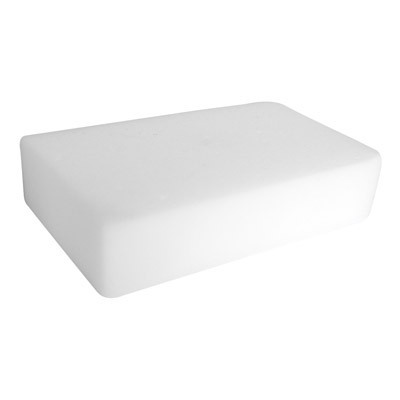 Here, we provide this foam eraser in a multi pack of 12, ensuring you'll always be prepared for any cleaning eventuality and allowing every member of your team to remain fully equipped. They are easy to store aside with your existing cleaning tools and are a handy options to have available to you. Our Janitorial Supplies category is packed with helpful products from our own branded Gompels Heavy Duty Stain Remover through to Microfibre Cloths - all available at exceptional wholesale prices.